Review: Star Odyssey | "DESTROY ALL FANBOYS!" After 20 long years one of a handful of “lost” Sega Genesis games finally surfaces thanks to Brandon Cobb and Super Fighter Team. While Star Odyssey may not be the best RPG on the platform, as a piece of gaming history, it’s something that’s truly great too see and play. Thanks to Cobb’s dedication to seeing the project through (and a solid localization job), a few hundred lucky gamers can now play this long lost gem and see what might have been had this one shipped when it was supposed to. Granted, I’m sure it wouldn’t have set the gaming world on fire back in 1991 or ’92, but the Genesis never really got as many great RPG’s as the SNES back in the day, so what’s here makes for a mostly solid game with a few quirks that keep it from perfection. The story takes a young man on a distant planet on a galaxy-hopping adventure after he’s saved from death by a mysterious voice from another star that tells him he’s needed elsewhere. On his journey, he’ll meet up with a small set of characters that range from a professional fighter looking for some sort of redemption, a female warrior out to save her kidnapped ruler, and a few alien types who get pulled into things as the plot progresses. As this is a game made before the era of lengthy cut scenes and deep character portrayals through voice acting. every emotion is conveyed through the English translation. Cobb’s writing is fine throughout, but even the original game (Blue Almanac) cut some pretty sharp dramatic corners when it came to some elements. Examples would be An early death of someone close to the hero is only briefly noted before the game moves on and a few of the party member’s back stories could have been better realized. Nevertheless, Cobb’s goal wasn’t to expand upon the original game nor rewrite it to fit more modern tastes. What’s here is an example of how console games were made before the 3D age hit, so warts and all, you’re getting a very straightforward experience. Par for the course in most JRPG’s, random turn-based battles occur quite frequently, but there are stretches where you can wander a bit before being attacked.The battle system is interesting, allowing for standard melee or weapon attacks for most of the characters. The hero and a few of the other characters can use element based spells to attack, defend and heal, but these skills need to be learned by leveling up each element as the game progresses. Additionally, your magic points can only be restored by resting at an inn or using an advanced spell to drain enemy MP, which makes things really tough the twisty, multi-level dungeons. Worse, for a long while, you ONLY have space for about seven items in your inventory including your gear and weapon! At one point, you’re all alone carrying a very necessary quest item, a weapon, armor and one accessory, leaving you with two measly slots for healing items! Getting lost is a bad thing here, as other than certain warp stations (usually one located in a city center) there’s NO way to quit out of a dungeon or to a safe town on the outdoor maps. You’ll be walking everywhere except for the few times when you see a nice shot of a spacecraft taking off to another planet (and even harder enemies). While you can run away from some fights, it’s not advisable thanks to enemies that gain levels as you (and eventually your party) explore maps. This keeps things always challenging throughout, as you begin the game solo and need to tough it out for a while until you meet up with your second party character. In the often crushing initial difficulty, I was reminded a tiny bit of another Genesis RPG, Sorcerer’s Kingdom, where over-powered enemies lurked about in areas and if you ventured forth unprepared, you and your party were dead pixels before you knew it. As you can only save at an inn (and later on a spaceship) in Star Odyssey. Expect to do a bit of loading if you get lost or sidetracked and run out of healing items. Once, I managed to crawl back to a town warp point with a mere 3HP left, thinking all the time that I was about to lose a half hour or so of hard work. You may also find yourself dragging a few corpses into a hospital for a bit of revival of you get hit hard enough. Still, better one or two dead heroes and some lost gold than restarting from an older save slot. The game’s big catch when it comes to teammates is each new member joins at level one (!!! ), which means that they’re supremely easy kills by any enemy that focuses even the least effective attacks on them. Fortunately, you can choose to Guard the weaker members by placing a more powerful character in front of them to absorb blows and spell damage. Unfortunately, too much guarding is a bad thing, as it also means one LESS character attacking, which is a pain when you have three aliens casting instant death spells on your party for a turn or two. Additionally, you’ll sometimes be attacked from behind, which gives enemies a free turn (which can be disastrous if you get unlucky) or you’ll be attacked from the front AND the rear, which isn’t that bad, as you get to go first if that happens. You’ll need to tap a button to turn your heroes right or left so they can deal out the most damage to enemies in the proper positions and as with the regular fights, taking down enemies as fast as possible is key to survival. Once you get into the rhythm of things, the difficulty balances out as you level up. Although you’ll run into some tough battles once in a while, the game actually gets easier for a short stretch once you abuse some early areas with a single warp that leads to an inn and shops. A few times during the game, you’re left short-handed as a character will eave for a bit as part of a plot point or you’re forced to only have two characters because the third slot will soon be filled once you survive a long, deadly slog through a dungeon. Very late in the game, you get a ridiculously weak character that levels up insanely quickly and ends up with some amazing spells. However, you’ll find soon enough that neglecting leveling ANY of your other party members in favor of this new character is a really bad idea. 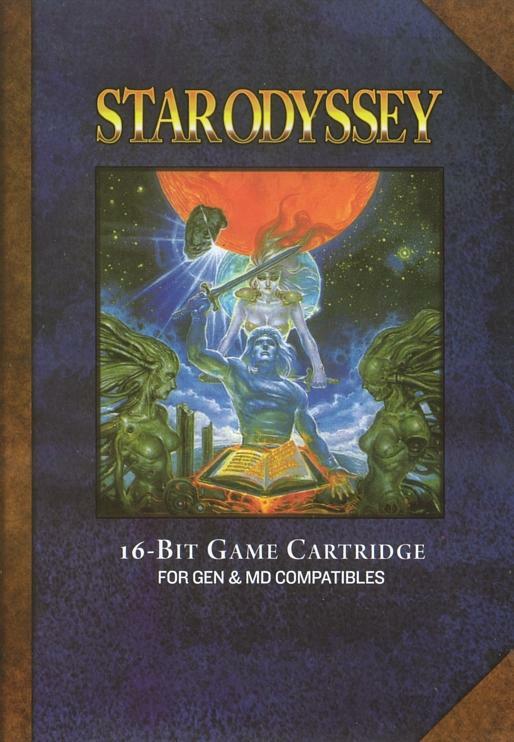 Visually, Star Odyssey is simple, early first generation or so 16-bit bliss and definitely not for all tastes. While there were indeed some developers starting to push the hardware, Hot-B wasn’t one of them. Still, the big characters in the battle scenes, the nicely rendered spaceships and that lovely intro all grow on you as you play. The score also plays a big part here with a few catchy tunes and battle music that’s not too bad considering you’ll be hearing it hundreds if not thousands of times. My only major issue with the game is that it’s pretty linear. You end up with a cool spaceship of your own, but you’re always pushed directly to the next planet with no looking back. Granted, there were only two smallish areas I didn’t fully get to explore on an early planet and the game is strict about the requirements for leaving a planet, so in the end, I really didn’t miss anything major. As usual, Super Fighter Team went for quality in the packaging, with a lovely full-color manual and great printing on the cover and cartridge labels. Unlike SFT’s other out of print games Beggar Prince and Legend of Wukong, the box doesn’t reflect the classic Sega Genesis style (no doubt due to this not being an officially sanctioned Sega product). Instead, the cover is a re-version of the Japanese original, resembling a hardcover book dust jacket. I hear some collectors are replacing the game case with an official Sega case just to have that continuity, but I’m keeping mine exactly as it is because that’s the way it should be (and I’m not planning to sell this any time soon, if at all). This entry was posted in Uncategorized and tagged 2011, Classic Video Games, Sega, Sega Genesis, Star Odyssey, Super Fighter Team, Video Game Reviews, Video Game Trailers by geelw. Bookmark the permalink. Great comments. I suspected this game would be linear but that’s ok. Most back in the day were. I was a little concerned about the large sprites of the characters in the battle scenes. From the screen shots they didn’t look so good. I was glad to hear you’re enjoying the over-all look of the game. I also love what Super Fighter Team has been doing. I hope they keep going strong! Pingback: BUY THIS! Super Fighter Team Goes Digital With The RPG Trifecta Pack | "DESTROY ALL FANBOYS!" Pingback: BOUGHT THAT! RPG Trifecta Pack Get! | "DESTROY ALL FANBOYS!"